Your best friend has found that “Bam!” “Pow!” “Wow!” romance and she’s getting married. With great power, comes great responsibility; you’d better throw her a zinger of a bachelorette party. She’s into superheroes –those muscular people who wear spandex and fight evil–so you already have the perfect theme. 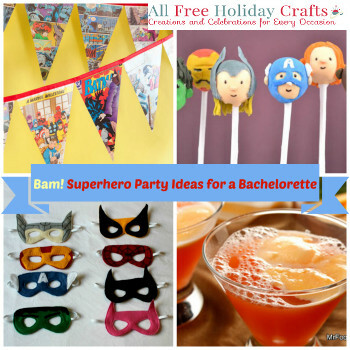 Here are some unique bachelorette party ideas gathered by your friends at AllFreeHolidayCrafts for a truly stupendous superhero-themed party! We’ll be your party planning heroes. First, start making your superhero-themed DIY party decorations as early as possible. 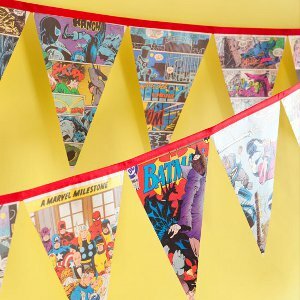 Go with a retro superhero comic book theme for punchy DIY party decorations. Paper party decorations will save you lots of time. When possible, try to decorate with logos and colors from superwomen like Wonder Woman and Batgirl. After all, this party is all about the girls. 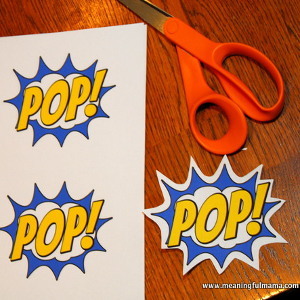 Comic Word Bubble Printables: It’s easy to make paper word bubbles with fun fighting words. 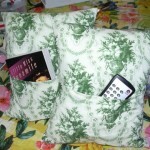 Then, just tape them over everything from condiment containers to cups. Superhero Comic Book Banner: This banner stands up against boredom with each unique pennant made from the pages of Batman, Superman, or Spider-Man. Comic-Wrapped Balls: Just substitute pages from a Wonder Woman comic book, and these would make great decorations to hang from the ceiling. Superhero Fan-ciful Garland: Get some fabric printed with superhero logos and make this garland faster than Superman can fly across the world. Next, it’s time to make some delicious desserts and cocktails. With just a swish of your cape, you can be a Super-Cook when you make these fun caped-crusader recipes for the bachelorette. Mmm, victory is sweet! 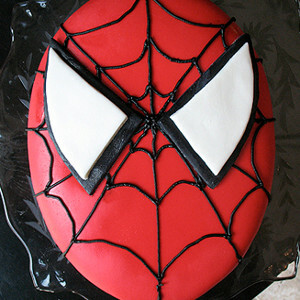 Spider-Man Cake: Are your spidey senses tingling at the sight of this easy cake? We feel the same way. Wonder Woman Cake: The bachelorette caught the love of her life in her golden lasso. Make her this Wonder Woman Cake from Bronnie Bakes before the engaged couple flies off in her invisible jet. Caped Crusader Cupcakes: Holy cupcakes, Batman! Pay homage to all the major heroes with these little cakes of justice. Avengers Cake Pops: You’ll be a cake pop hero when your bachelorette broads see these works of art. Hero Punch: It’s a bird! It’s a plane! It’s a super-cocktail! It’s a bachelorette, after all. Try this tasty red champagne punch. See more superhero-themed cocktail recipes at Comics Alliance. Plan your party activities to get the girls into your superhero theme. Here are some fun bachelorette ideas to keep everyone entertained. Soon, it will be time to fly into action with these superhero party games and activities. X-Women Masks: Pass out craft felt masks, ribbon, and markers and let your League of Extraordinary Ladies decorate their own superhero disguise! 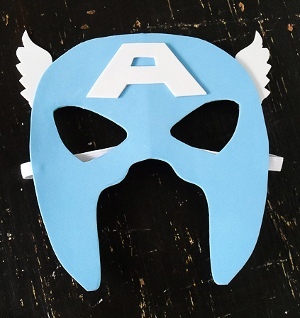 See a more detailed mask, the Captain America Mask on FaveCrafts. Superhero Telephone Box: Fly in the face of the camera and save memories of the superhero bachelorette party by taking some amazing photos. Making a Superhero Telephone Box, like this one by DIY on the Cheap, is a popular superhero party idea. Superhero for a Day Pictures: This photo idea for kids that could definitely be updated for adults. Just add some hilarious, props to this flying-over-the-city scene and this idea is bachelorette-ready! Using all your superpowers of craftiness, creativity, and cooking, you will triumph over all others to give your BFF the best bachelorette ever! Which superhero would you marry? This Saturday, May 3rd, is Free Comic Book Day. On this day, generous comic book shops throughout the country give away comics, completely for free! Since we love superheroes and all things free at AllFreeHolidayCrafts.com, we’re celebrating this super-holiday with superhero crafts inspired by everyone’s favorite comics. Just because Comic Book Day is once a year doesn’t mean that these DIY projects have a deadline. Celebrate your inner-hero on the daily with decorating ideas, creative recipes, and amazing costumes, masks, and capes! Don’t forget to head out to your local comic book store this Saturday to grab your free comic, perhaps dressed in one of the handmade costumes below. Be the hero on Free Comic Book Day with our favorite superhero costumes and capes. No matter what your favorite comic book is, there’s a simple superhero craft you’ll enjoy below. Put your sewing skills to the test and create a cool cape or mask. 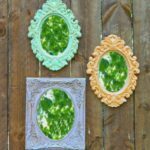 Get your home ready for Free Comic Book Day with a few handmade decorations that you’re sure to love. Invite all of your comic-obsessed friends over so you can read your free comics together! 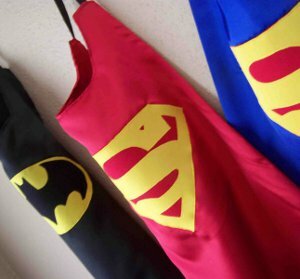 A party isn’t a party without decorations, and the ones below are super, man! 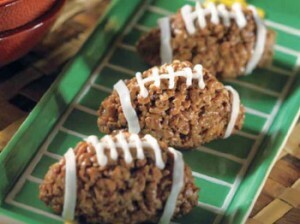 After your decorations are in place, you’ll need some super-snacks to replenish yourself. From Spider-man to The Avengers, the cute treats below perfectly demonstrate your comic book craze. Rough and tough it with the boys. It’s no secret that boys like to play in the mud, cheer extra loud for their favorite sports team, and wear a superhero cape around the house. What can you say? Boys will be boys. 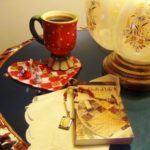 If you grew up with all girls, like me, and have no idea how to entertain those little balls of energy, then this is the perfect list for you. 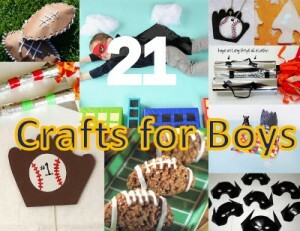 All these crafts are kid-approved, and boys are sure to have a great time with any and all of them. 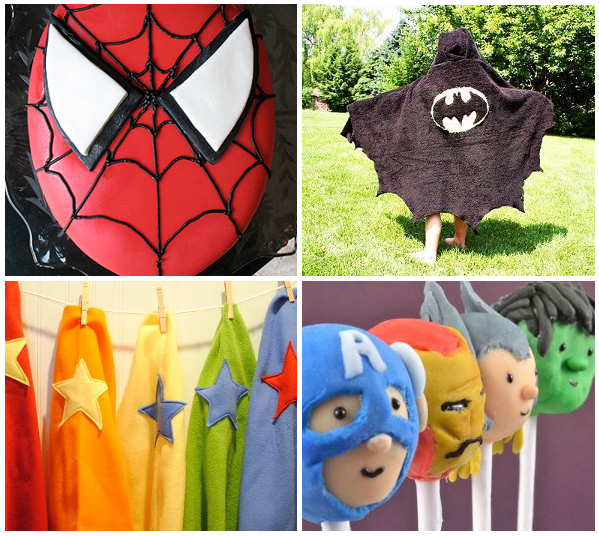 From football Rice Krispie treats to a Batman bath towel, these crafts for boys are so much fun to make. 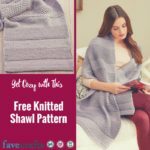 Sometimes it’s hard to find crafts that boys will be interested in, or ones that will hold their attention, but you don’t have to worry about that anymore. You can choose from sports, science, or superheroes to find the perfect project. Go team, go! It’s no secret that little boys love to chant and cheer for their favorite sports team. Whether it’s basketball, hockey or baseball, sports can be so much fun to watch. When you go out to your next ball game, don’t forget to bring the #1 Baseball Fan Sports Craft. You can show everyone just how much you love baseball by being the biggest fan in the entire stadium. You can fly up, up, and away in your homemade rocket. Well, water bottle rocket, that is. 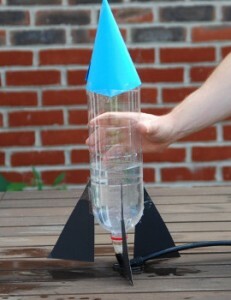 Make the Water Bottle Rocket craft and you can see just how much fun science and physics can be. Science experiment crafts are great for kids because they teach them all about the world and how it works. 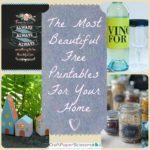 If you have a naturally curious mind or want to explore everything that is around you, then you will love these crafts. Avengers, assemble. Every little boy has a favorite superhero who is someone he looks up to. Whether it’s Captain America or Iron Man, superheroes are great role models. These delicious Earth’s Mightiest Avengers Cake Pops are so cool, and you can make your favorite guy. These superhero craft ideas for kids are great because at the end of the craft, you have something yummy to eat! Would you rather do a sports, science, or superhero craft, and why? In a crafty nod to the final Batman movie in the Christopher Nolan trilogy, I scoured the internet for the very best in bat-related projects. And, as it turns out, a ton of Batman fans are also very talented yarn crafters! 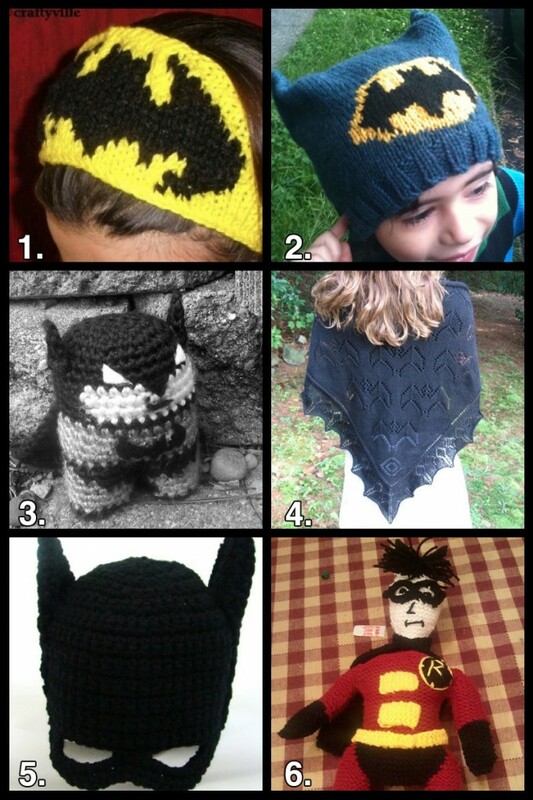 So, to celebrate this awesome trend in geek crafting, I’ve put together a roundup of my favorite Batman-inspired knit and crochet projects. Enjoy! Need more geeky superhero ideas? Check out my Avengers Superhero Craft Roundup right here on FaveCrafts! I remember spending Saturday mornings with my younger brother watching Power Rangers and Batman. It was our weekly ritual. My brother, who was (and still is!) obsessed with Batman, had every toy and gadget Batman had, from the utility belt to the rubber Batman mask. His collection of Batman figurines spent hours in our bathtub, rescuing my Barbies from a certain water-whirling death. With the upcoming release of the new Batman movie this summer, as well as the more recent releases of The Avengers, Iron Man, and Spiderman, superheroes are all the rage right now! Lovers of The Avengers can make this awesome Captain America Mask to wear for Halloween or just for fun! 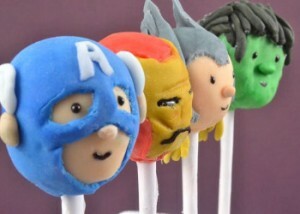 Avengers fans are also sure to love these adorable Avengers Cake Pops. They would be perfect for a little boy’s birthday party. And if you or your little one like The Last Airbender, be sure to check out this Aang Hat. 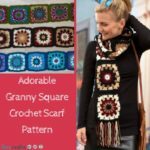 It’s an easy crochet hat to make and is great to wear anytime. Of course, my personal favorite is this Dark Knight Bathman Towel. I wish I had this growing up! It would have made bath time a blast! 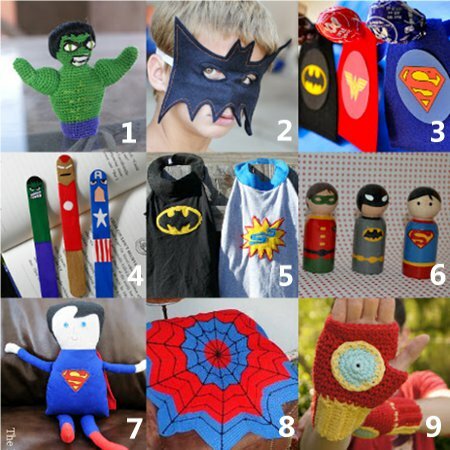 Now you can be a crafting superhero with these awesome superhero crafts that I found on the Web (no thanks to Spiderman, sad to say!). Leave a comment and tell us which one of these is your favorite! Are you Avengers obsessed? 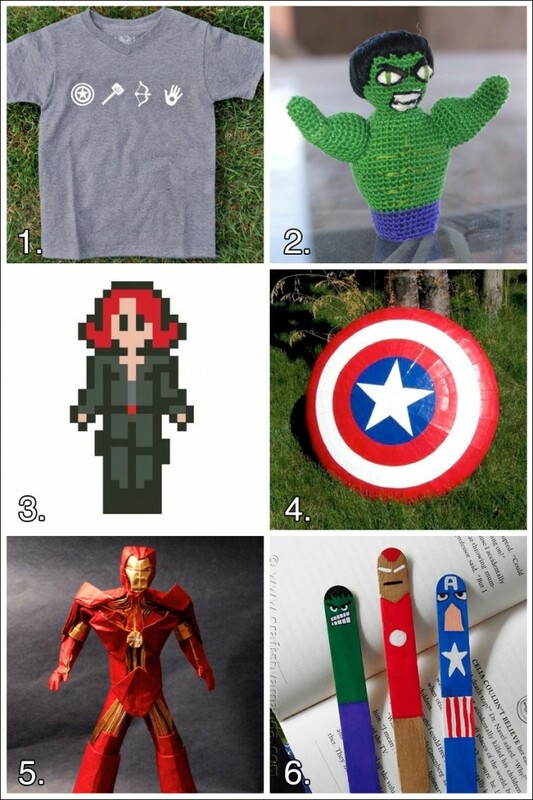 Here’s a roundup of my favorite superhero-tastic projects from around the crafty internet! 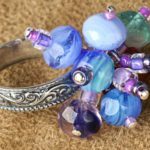 For even more action-packed ideas, check out my Geek Crafts: Nerdy Nail Art and Geek Crafts: Star Wars Craft Roundup articles right here on FaveCrafts! Who’s your favorite Avengers hero?